Since the Toxic edition of the HD4870 is £30 more expensive than the stock version and it has three key improvements over the latter, it follows that if each one is worth ten pounds of your money, then this is the card to buy. For a start, it comes with the full fat 1GB of memory, and while it may not allow the card to achieve stratospherically higher scores than the 512MB HD4870, the gap between this and the HD4850 is the difference between playable and not playable at high quality settings – even though both are saddled with the same number of ROPs. It's absolutely worth the investment of ten pounds if you are running a larger monitor. That's helped, of course, by the second advantage of the Toxic. The elegant heatsink isn't just lovely to look at if you have a window in your case, it cools the card sufficiently that Sapphire has upped the clockspeeds by a notch too – and opens up headroom for you to do the same again. That overclock doesn't make as much overall difference as the extra memory, but it does help to close the gap between this card and the higher spec HD4890 to something almost negligible. Again, we'd sacrifice a round at the pub for that. The final part of the package is what seals it for us, though. The Vapor-X cooler doesn't just let the card run faster, it's damned near silent too. That's almost worth the extra £30 alone if your ears are as fan battered as ours have become over the years. 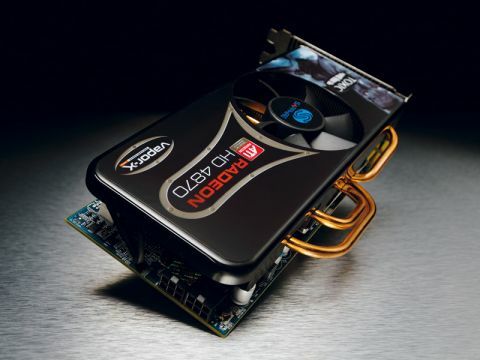 Compared to its closest NVIDIA rival, the GTX260, the Toxic edition of the HD4870 has the edge too. They're priced identically, and performance is hard to tell apart, but in the few benchmarks where one card has a clear advantage it's this one.